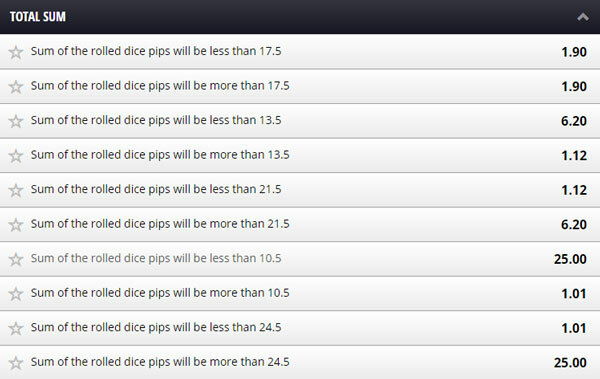 Betgames Dice - Live betting on dice. Betgames Dice is very similar to the popular Asian dice game Sic Bo. 5 identical dice are rolled once every 5 minutes by the game presenter onto a table top. As long as all the dice land with a face flat down it’s a valid roll. There is only one betting round. 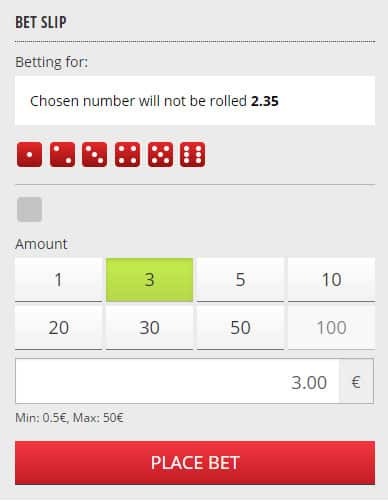 Bets can be placed before the dice are rolled. The Video shows one game round being played. There are 4 types of bets you can make. Here you can choose to bet on sequences, pairs, multiples of the same number or if the dice will all be different. The longest odds are for 5 of a kind which pays 500:1. Some of these are technically combinations. But no matter, this is where you select multiple numbers, or whether the result will or won’t contain a number. Theses are bets that cover the sum of the dice when they are all added up. You can bet High or low. The average for all dice added together is 15 (that’s 3 points per dice), so this gives you a baseline to bet from. (well that’s how I do it!). Bets for whether the dice totals will have an odd or even number total or if there are more dice with odd/even number of pips. You use the Bet Slip to place your bet. 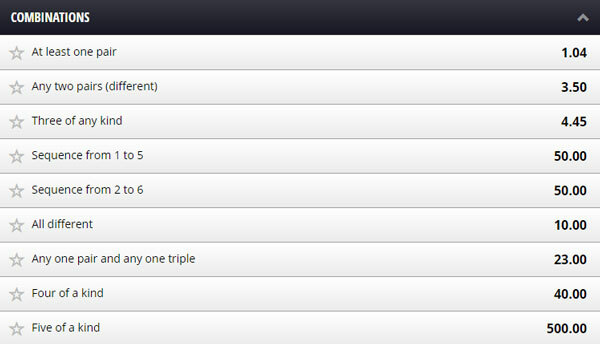 Select one of the options on the bet selection grids and the bet slip will show the details for making that bet. Select the details and the bet amount and press “Place Bet”. You can bet on as many of the combinations as you like. The results are a little hard to see on the screen and the live feed closes quite quickly so it’s possible to miss the result. Fortunately, BetGames has a solution and once the game has completed the splash screen is updated to show the last 5 results.